Gavin Smith brings it in with the . Paul Volpe completes, Jason Stockfish calls, and Benjamin Ludlow calls. Smith folds. Volpe leads on fourth and fifth street, and both Stockfish and Ludlow call twice. On sixth street, Volpe checks, Stockfish checks, Ludlow bets, Volpe folds, and Stockfish calls. The seventh card is dealt down, and Stockfish leads out. Ludlow calls. Stockfish tables for a seven-six low, and Ludlow folds his hand. Players are on a 20-minute break. Bart Lybaert raises on the button. Benjamin Ludlow makes it three bets from the small blind, and Lybaert caps it. As Lybaert has little behind, the rest goes in dark before the flop is dealt. The board runs out . Ludlow scoops with a six-high straight and the nut 6-5-4-2-A low, sending Lybaert to the rail. 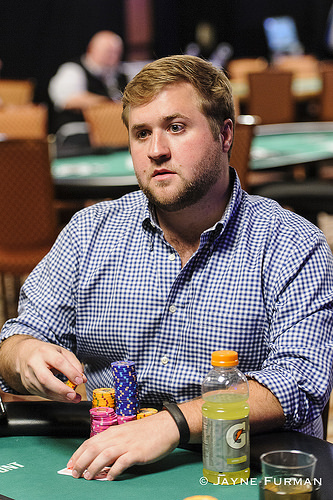 With his seventh place, Lybaert already scores his fifth cash of the 2016 World Series of Poker. 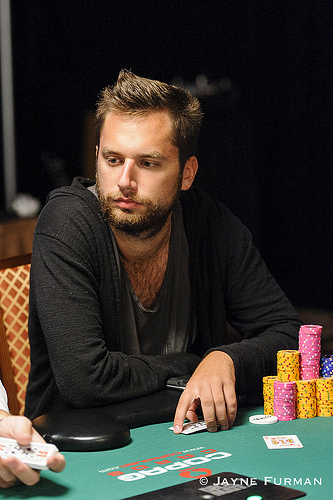 The Belgian, who already amassed over $100,000 in winnings, looks poised to take on Konstantin Puchkov's record number of 12 cashes in one series, set in 2012. Jason Stockfish raises from early position and Paul Volpe is the only caller, from the big blind. The flop is and Volpe check-calls one bet from Stockfish. The turn is the and Volpe again check-calls one bet from Stockfish. The river is the and Volpe checks. Stockfish puts out a third bet and this time Volpe elects to fold, giving Stockfish the pot and moving him over one million in chips for the first time today. Paul Volpe brings in, Ron Ware completes, Tony Lazar, Bart Lybaert, Benjamin Ludlow, and Volpe all call as well. On fourth, Ludlow checks, Volpe checks, Ware bets, Lazar and Lybaert call, Ludlow folds, and Volpe calls. Lazar has first action on fifth street. Everyone checks to Ware, who bets again. Only Lazar sticks around. Ware has no intention of slowing down on sixth street. After Lazar checks, Ware bets, and Lazar tanks for a while before folding. Action folds to Jason Stockfish on the button and he raises to 20,000. Bart Lybaert, in the big blind, is the only caller. The flop is and Lybaert leads out for 20,000, a bet which Stockfish calls. The turn is the and Lybaert bets again, this time for 95,000. Stockfish thinks for about a minute before calling. The river is the and Lybaert looks at his chips before sliding out a 115,000 bet. Stockfish re-checks his cards before moving all-in for 500,000, easily covering Lybaert. Lybaert looks pained and tanks for about two minutes before frustratingly flicking his cards into the muck. Tony Lazar opens in early position to 18,000. Bart Lybaert three-bets to 46,500 in middle position. On the button is Gavin Smith, who puts in a cold four-bet to 115,000. Both Lazar and Lybaert quickly get out of the way, allowing Smith the pot. Benjamin Ludlow opens under the gun, and everyone folds. Ludlow can't believe it, as he tables for the pat-dealt "Number one," deuce-to-seven's best possible hand. Ludlow has to settle for just the blinds with his monster. Jason Stockfish brings it in, Benjamin Ludlow completes, Paul Volpe makes it two bets, Ron Ware calls, Jason Stockfish calls, and Ludlow calls. On fourth street. Ludlow checks, Volpe checks, Stockfish bets, Ludlow folds, Volpe calls, and Ware calls. Stockfish has a paired board on fifth street and bets. Volpe calls, then Ware puts in two bets. Stockfish calls, and Volpe folds. On sixth and seventh street, Stockfish bets his double-paired board and Ware calls it off. Stockfish has for a full house, fours over threes. Ware shows and plays 8-7-5-2-A for a low to chop the pot. 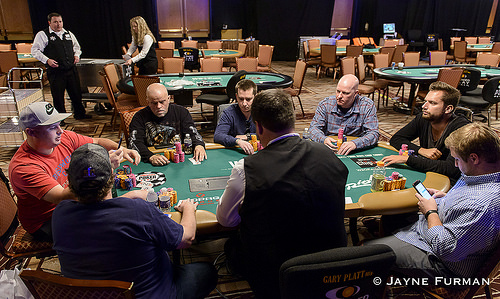 Action will continue on an outer table until one more player is eliminated, and then will move to the main feature table in the Amazon Room. A very short-stacked Tommy Coker opens to 18,000 in the small blind, and Bart Lybaert defends his big blind. On a flop, the remainder of Coker's chips go in, with Lybaert calling it off. Coker flops top pair and an open-ended straight draw, but Lybaert's royal-flush draw has strong chances. The turn is the , giving Coker two pair, but also giving Lybaert a straight. The river gives Lybaert a flush to seal the elimination. With Coker's elimination, the remaining seven players will redraw for the unofficial final table. Seating and chipcounts will follow soon. 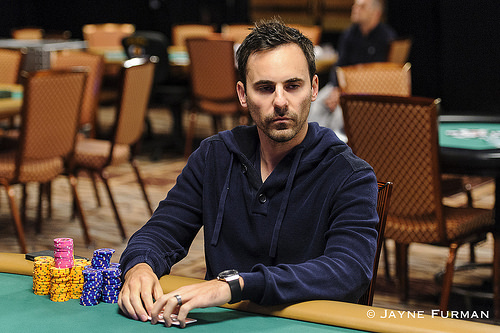 Benjamin Ludlow raises on the button, and Bart Lybaert defends his big blind. On the flop, Lybaert check-calls a bet from Ludlow. Lybaert check-calls a bet again on the turn, and both players check the river. Lybaert indicates he hasn't got much, and Ludlow tables . Ludwig puts his ace-king out in front, indicating he has top two pair, but he actually plays for the nut straight. The floor is called, as checking the nuts behind isn't allowed. Ludlow gets a one-hand penalty, having to sit the next hand of Omaha Hi-Lo out. Jason Stockfish brings it in with the . Benjamin Ludlow completes with the , and Stockfish comes along. Ludlow leads out fourth street, and Stockfish calls. On fifth street, Stockfish pairs his up card, giving him first option. He bets fifth, sixth and seventh street, and Ludlow calls each time. Stockfish flashes the , indicating he has trip treys, but Ludlow shows , showing the winner with trip kings. Chris Klodnicki raises to 15,000 under the gun. 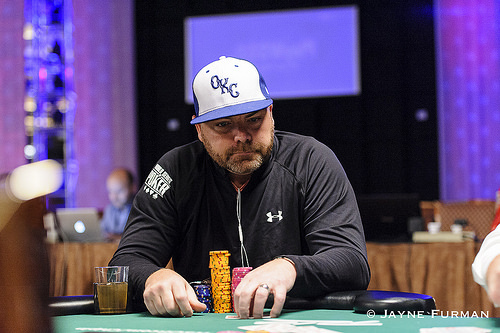 Gavin Smith folds on the button and Paul Volpe three-bets to 46,000 from the small blind. Ron Ware folds in the big blind and Klodnicki thinks for about 60 seconds before moving all in for around 350,000. Volpe quickly calls. 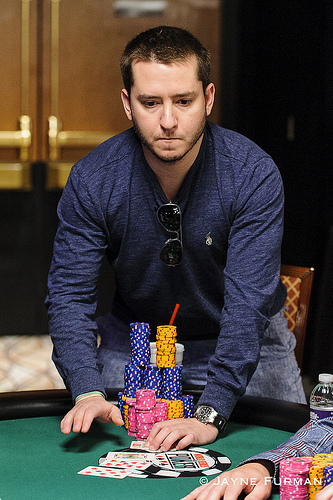 The board runs out and Klodnicki is eliminated in ninth place, taking home $10,526. Bart Lybaert opens from the cutoff, Tony Lazar puts in three bets from the small blind, and Lybaert calls. Both players draw one on the first draw. Lazar bets, and Lybaert calls. Lazar stands pat on the second draw, while Lybaert opts for one. Lazar bets, Lybaert raises, and Lazar calls. Both players stand pat on the final draw. Lazar check-calls another bet from Lybaert, and the hands go to showdown. Lybaert's "number three" (the third best possible deuce-to-seven hand) edges out Lazar's smooth eight, giving the Belgian the huge pot.